All things merry to you and yours!!! xoxo. Brian is originally from Michigan, making the chocolate + cherry combination dear to his heart and stomach. 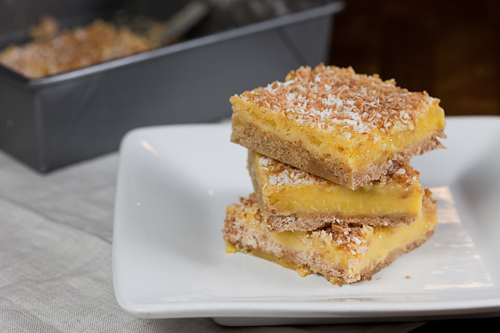 I am always looking for recipes that combine the two, and this one from Baked in New York is quite perfect. 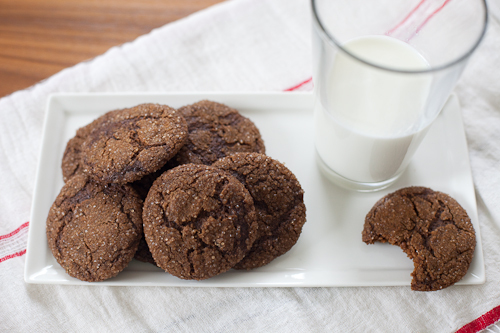 The dough is very sticky and fudge-like, and the resulting cookies are super-moist and chewy. 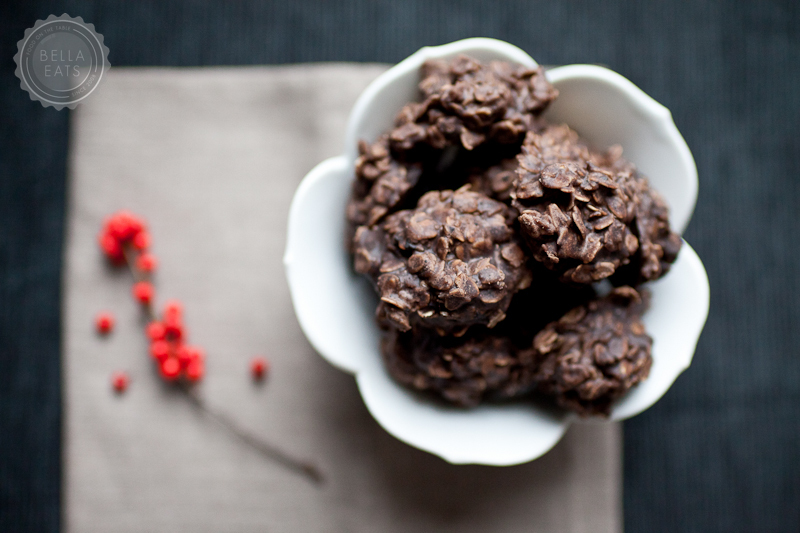 The dried cherries provide the perfect burst of tartness to counter the rich chocolate. 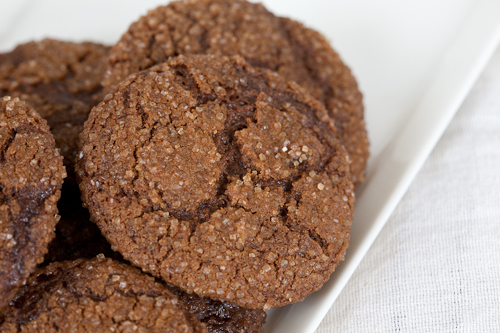 I realized as I typed up the recipe that I completely left out the brown sugar, but the cookies were still delicious. In fact I think I like them better than what they should have been, as I really can't imagine them being any sweeter than the version I made. In a large nonreactive metal bowl, combine the dark chocolate and butter. Set the bowl over a saucepan of simmering water and cook, stirring with a rubber spatula, until the chocolate and butter are completely melted and the mixture is smooth. Set aside to cool. Add the flour mixture and mix on low until just combined, about 10 seconds. Do not over mix. 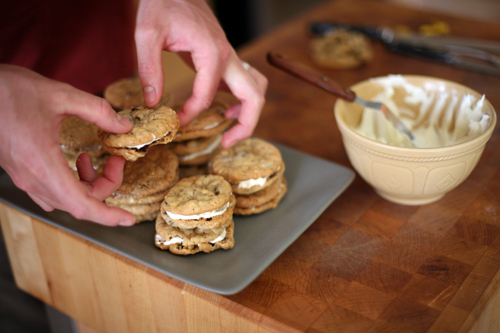 Using a spatula or wooden spoon, fold in the chocolate chips, white chocolate chips, and dried cherries. The dough will look very loose, but it will harden in the refrigerator. Refrigerate for 6 hours or overnight. Spread two cookie sheets with parchment paper. Using a 1 tbsp scoop or a spoon, place dough in rounded mounds on sheets, about 1-1/2 inches apart. Bake for 12-15 minutes until the tops of the cookies are beginning to crack. Let cool on sheet for 10 minutes and then move to a cooling rack to cool completely. 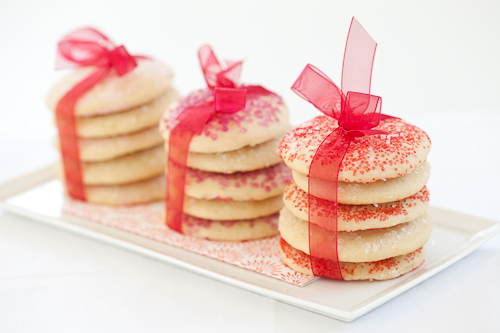 Cookies can be stored in an airtight container for 3-5 days. Speaking of Michigan (Brian's home state), this cookie comes from his Nana, and has been a staple since he was a little boy. I think that this may be his very favorite cookie recipe. I get the best reaction from him when I make a batch, way better than any layer cake I labor over for a full day. They take 10 minutes to whip up, another 20 to harden, and you're done. So simple. Plus, we always have the ingredients needed to pull these treats together, so they are perfect for last-minute guests or a holiday pot luck. 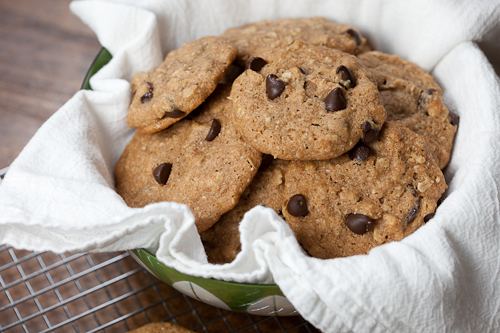 I tried once, years ago, to make these cookies healthier by substituting out the butter, using less sugar, etc. Big mistake. Just keep them as are and enjoy. Combine cocoa, sugar, butter, and milk in a medium-size sauce pan over medium heat. Simmer for 2 minutes and remove from heat. Add peanut butter, vanilla, and oatmeal to pan and stir to combine well. Spoon onto waxed paper in 1 tbsp lumps (a small ice cream scoop works well for this) and let sit until the cookies are set. Store in a sealed container for 3 days. When I was a very young girl, I broke a little boy's heart on Valentine's Day. It is not a moment for which I am proud. In fact, like my Momma, guilt sticks with me as tightly as my own shadow, no matter how many years have passed since the event that forced the creation of those feelings and their permanent lodging in my gut. And so I still think of that towheaded little boy who, on February 14th, 1988 gifted me a very special heart-shaped puzzle, red with tiny white and pink flowers, that professed his adoration of a very young, pigtailed Andrea. I was only five, and still believed whole-heartedly that little boys had highly-contagious cooties, passable even by touching the same paper card. Mortified, I clutched the present, not even pausing to whisper "thank you" to the shy child, and turned as quickly as I could to the girl at the neighboring cubby. I thrust the puzzle in her direction, saying something along the lines of "he wants me to give this to you" and fled the scene as quickly as possible. Finding comfortable ground in a nearby gaggle of little girls, I turned back towards my cubby just in time to see the devastated look on a heartbroken freckled face. Oh, the guilt. I received quite the lecture from my Momma that night, about feelings and how not to hurt those of others. 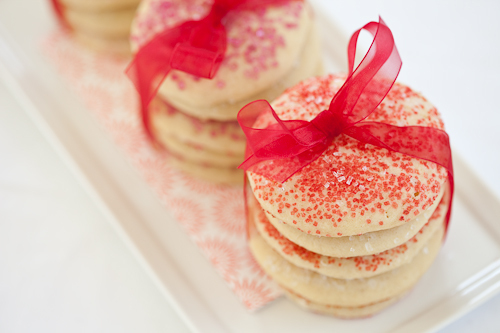 I came to embrace Valentine's Day with its red and pink decorations, the elementary school parties with tiny cards displaying cartoon characters and the frosted cookies from our Room Mom. Future Valentines found a much more amiable object of their affections, one who said "thank you" after receiving a gift and who even sometimes had one to give in return. There were flowers and balloons and candy, hand-holding and blushes and shy middle school kisses. The holiday intensified in high school, when suddenly having a boyfriend on February 14th was a very big deal. Girls would walk around all day with balloons from their beloved tied to their backpacks, a vase of flowers in their hands. I received gold jewelry from two sweet boys two separate years, and eagerly compared the baubles to those my girlfriends had received. Gold! In high school! Valentine's Day was a competition, full of pressure to find a date, to go out for a fancy dinner, to give and receive gifts that displayed an accurate level of affection. Until I met Brian. When you meet your One, the novelty of Valentine's Day wears off quickly. It's corny to say, I know, but Brian and I truly do strive to make all of our days together special, to write love notes and give gifts on days other than those we're "supposed" to. We have a comfortability that comes after years of marriage, and with the knowledge that we're each other's Only. There are no expectations of flowers and heart-shaped boxes of candy, no exchange of red lingerie for boxer shorts covered in tiny Cupids, no giddy phone calls to my girlfriends to compare our jewelry, no disappointment if none of the above happens. We simply enjoy spending the evening with each other. 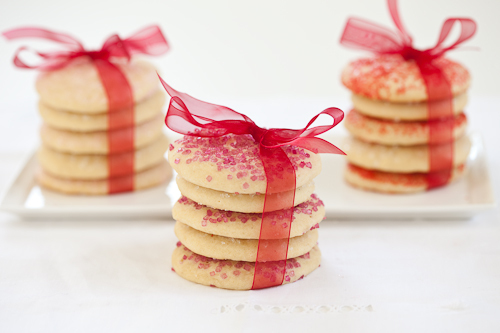 Anything extra is just icing on the cake, or sugar sprinkled on a cookie. 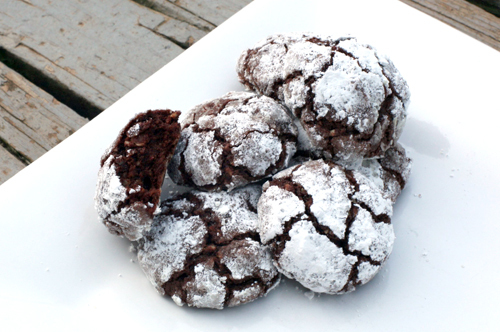 These are Brian's very favorite cookies, an old family recipe slipped to us by his Aunt Lynn. So soft and moist, they very nearly have the consistency of cake. The hint of nutmeg is the perfect amount, I urge you not to mess with it. The dough is extremely sticky and troublesome to work with, so don't be afraid to use flour liberally as you roll it out. If you'd like to decorate the cookies with icing when they are cool, I recommend Martha Stewart's Royal Icing, which, although tooth-achingly sweet, dries beautifully. In a large mixing bowl, cream the butter and sugar until light and fluffy. Add beaten egg, salt and nutmeg and blend well. Mix together the baking soda and buttermilk in a small bowl until foamy thin. Add to the creamed mixture, along with the vanilla. Sift the flour into the creamed mixture and blend well. Place plastic wrap in mixing bowl directly on top of the dough, and refrigerate overnight. The next day, preheat your oven to 375* and line two sheet pans with parchment paper. Remove 1/3 of the dough from the mixing bowl and place on a moderately-floured surface, leaving remaining 2/3 dough in refrigerator. Roll to a heavy 1/4-inch thickness, liberally flouring the dough as you go to keep it from sticking to the rolling pin. 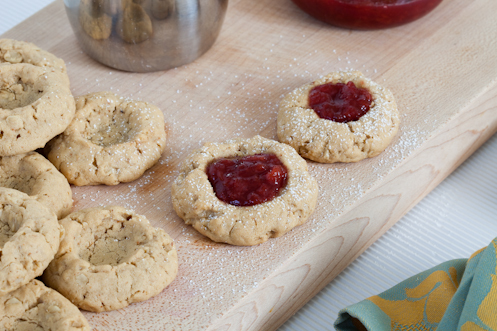 Cut quickly with cookie cutters of choice, moving cookies to sheet pans and spreading them about 2-inches apart. Sprinkle with sugar if you don't plan to ice them after baking. Repeat with remaining dough. Bake for 10-12 minutes until cookies are just starting to turn golden at the edges. Be careful not to over-bake them, as you want to maintain the soft interior texture. Let cookies cool on pan for 5 minutes before moving them to racks to cool completely. Store in airtight containers for up to one week (good luck keeping them around for that long...). 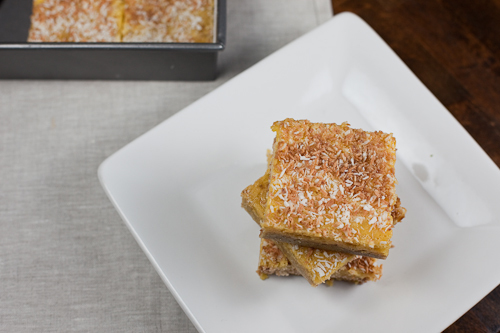 This recipe appeared on SuzySaid - Charlottesville this week, as part of my weekly recipe contribution. I have a bit of an issue with baked goods. One might actually be more inclined to call my 'issue" a minor addiction, as my mind seems to focus on one track when I find myself in a room that also harbors some form of baked treat. Like a moth to a flame I am drawn to whatever chocolate-y, vanilla-y, fruity, fluffy, cakey, crumbly goodness my eyes or nose pick out. It takes an immense amount of willpower to resist the temptation of dessert no matter the time of day, and there are certain months of the year when what little willpower I have takes off on vacation and leaves me defenseless to the siren song of sweets. Those months would be November and December, when it is nearly impossible to take ten steps without encountering a variety of cookie, cake or brownie that somebody is offering up. I brought the temptation upon myself even earlier last year, filling the month of October with various types of pie in preparation for the upcoming holidays. I grew accustomed to dessert every night until finally, in the first week of the new year my practical self, the side of me that recognized that my pants were getting a little *ahem* snug in certain areas, intervened and told my over-indulgent self to lay off the 'goods. Not one to jump on board with any overly restrictive, treats-prohibiting, quit-cold-turkey diets, I recognized the fact that I simply needed to find some healthier options to satiate my cravings for sweets rather than eliminating them from my life completely. I browsed the archives of Bella Eats' leaner, more fitness-focused days and came across this recipe for banana date bread*, an old favorite and one that I'd nearly forgotten about. In no time my kitchen smelled of baking banana and cinnamon as I pulled a loaf from the oven. Spread with a bit of almond butter and paired with fresh fruit it served as breakfast for Brian and I several mornings in a row. Inspired by my first healthy baking activity in months, I decided that afternoon to start experimenting with a new type of cookie. Or, rather, a granola bar masquerading as a cookie. That was my hope, anyway, to create a cookie so chock-full of good-for-me ingredients like oat bran, rolled oats, dried fruit and whole grain flour, without the less desirable ingredients such as butter and refined sugar, that I'd be able to eat several of them for breakfast. Or for a snack before my new workout routine. Or right before I go to bed while I'm waiting for the dogs to come in from outside. You get the idea. 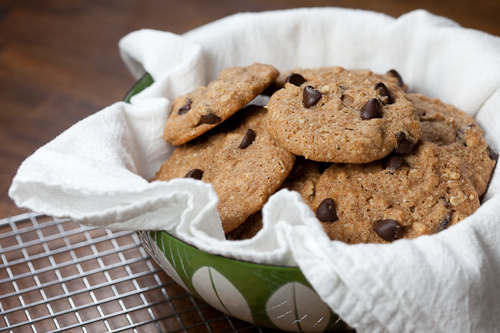 What resulted is a soft, chewy cookie that IS full of delicious and hearty ingredients, minus butter, refined sugar and even eggs. The whole grains provide a flavorful backdrop for the dried cherries and dark chocolate that punctuate each bite. 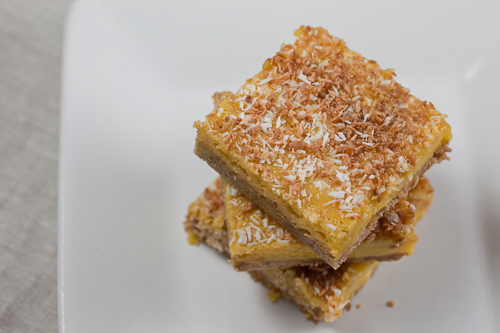 I made them three times within two weeks, tweaking the recipe until I was satisfied with the final result. 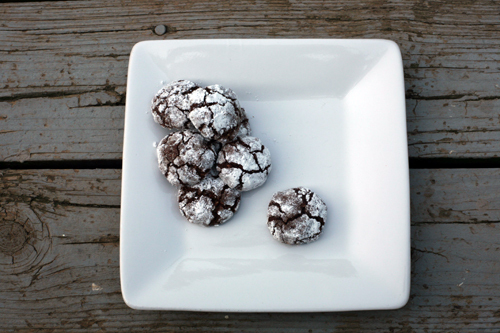 The photographs in this post are actually of the second batch - the final batch saw the addition of a bit more baking soda and the resulting cookies weren't as flat as those pictured below, so don't be surprised if yours look a little different. In the end, I don't know that there is actually any caloric difference between these cookies and your standard variety. But I can assure you that they are delicious, and any calorie savings I might have seen were made up for when I reached for another cookie. And another. I just can't help myself. I've decided to start running again instead. Position oven racks in center and top third of oven. Preheat to 350*. Line 2 large baking sheets with parchment paper. Sift the flour, baking soda, cinnamon and salt together in a large bowl. Add the oat bran and rolled oats and whisk to combine. Make a well in the center. Whisk the fruit juice concentrate, canola oil and vanilla together in another bowl. Pour into the well and mix together with a wooden spoon. 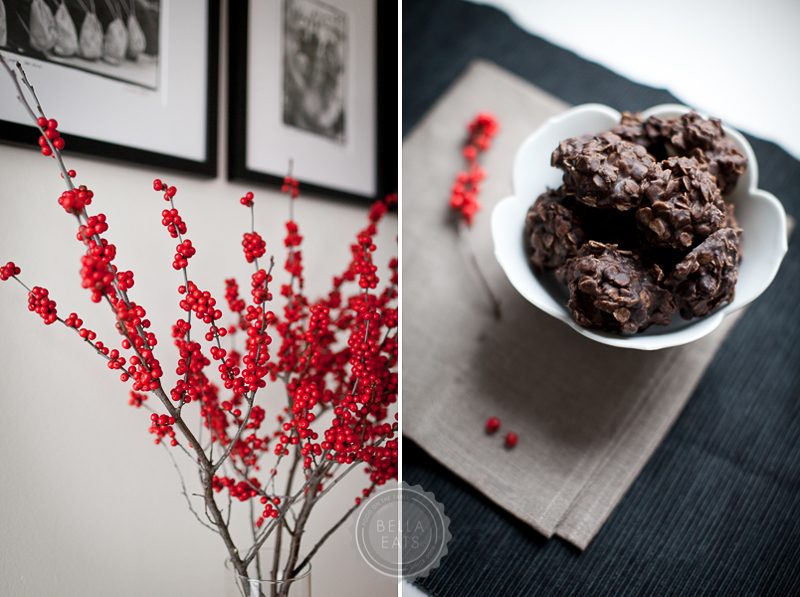 Stir in the chocolate chips and the dried cherries. Cover and refrigerate until firm enough to scoop, about 1 hour. 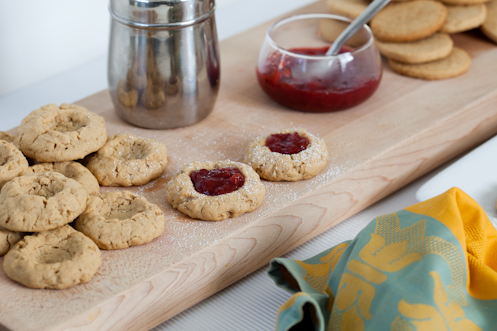 Using about 3 tbsp dough per cookie, transfer the dough to the baking sheets and space 2-inches apart. 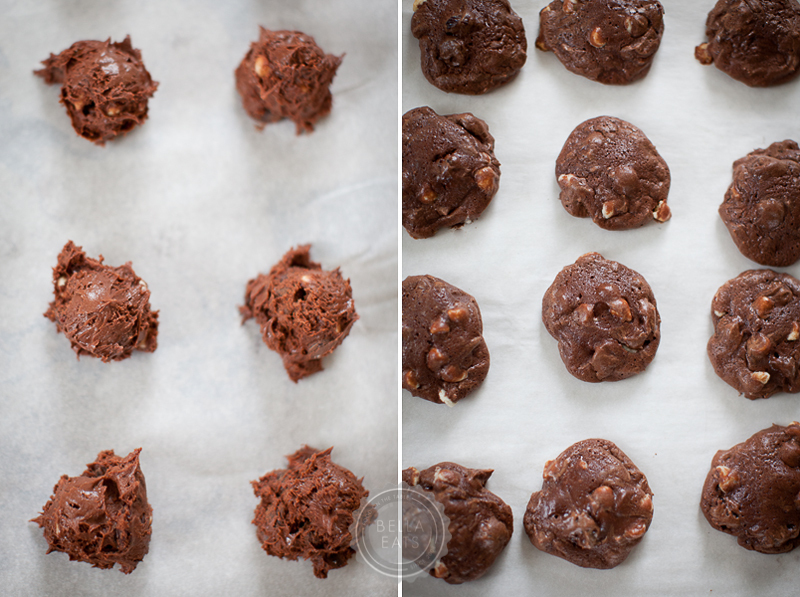 Bake the cookies until the edges are lightly browned and they feel firm in the center, 12-15 minutes. Halfway through baking, switch the position of the baking sheets. Cool the cookies for 2 minutes on the baking sheets, then transfer to a wire rack to cool completely. * A note about that bread - I substituted a 1/2-cup of fat-free vanilla greek yogurt for the applesauce and it was absolutely divine. Try it! ** The third time I made these cookies I only had a 1/2-cup of FruitSweet left, so I substituted a 1/4-cup of pure maple syrup for the remaining sweetener. It was delicious, and I loved the extra flavor added to the cookies. 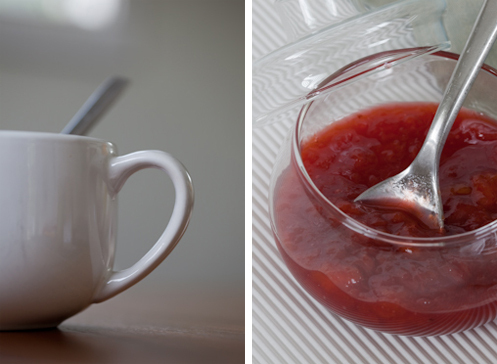 If you can't find liquid fruit juice concentrate, I'd try substituting maple syrup for the full amount of sweetener. Maybe leave out the vanilla though. And then tell me how they turn out! As I write this post snow is softly falling outside, turning my little city into a winter wonderland. In the five winters that Brian and I have spent in Virginia, we've never seen a snowfall like this. Its breathtakingly beautiful, the 22-inches we've received so far softening the landscape with a blanket of white, turning our street into an unrecognizable scene dotted with pedestrians in bright winter parkas out enjoying the snow. Holed up inside for the day, I managed to pull myself away from the window for about an hour to satisfy the urge to bake. An urge that is unavoidable when your outside world is blanketed with snow and inside, curled up in your favorite chair, under a quilt, with hot coffee (and perhaps a splash of Bailey's Irish Cream...), you are toasty warm and feeling very domestic. 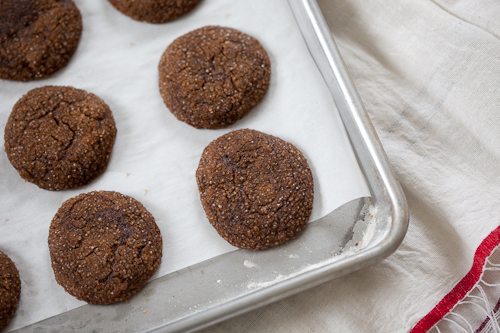 I'll share the cake that I just pulled from the oven in the next day or two, but on this snowy afternoon I feel it appropriate to give you a recipe for some chewy ginger cookies. They feel so very 'snow day', the perfect snack waiting on the counter when you come in from making snowmen and snow angels. Ginger cookies have been a longtime favorite in our household, but I do believe that this is the first time I've ever made them myself. I've helped my momma on many past Christmas Eves to roll out perfect little balls of ginger snap dough, the delightfully crunchy cookies a staple between meals on Christmas day. But last year Brian and I were introduced to a different variety of ginger cookie, one that was chewy rather than crispy in texture, and laced with chunks of crystallized ginger. Brian declared them his favorite cookie, ever, and I vowed to find a recipe to replicate them prior to the next Christmas. Lucky for me, Bon Appetit read my mind. 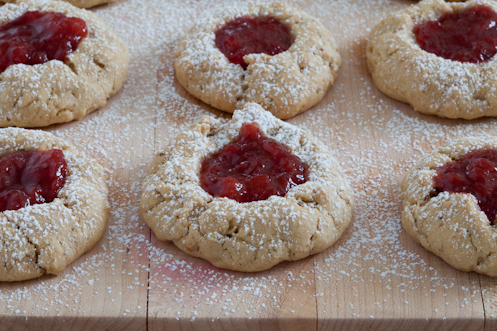 We love the soft, chewy interior texture of these cookies, complemented perfectly by the crunchy shell of turbinado sugar that coats the exterior. The bits of crystallized ginger throughout are wonderful surprises. Position 1 rack in top third of oven, 1 rack in bottom third; preheat to 350*. Line two baking sheets with parchment paper. Whisk together flour, crystallized ginger, baking soda and 1/4 tsp salt in a medium bowl. Using an electric mixer, beat butter until creamy and light in a separate bowl for about 2 minutes. Gradually add brown sugar and beat on medium-high speed until creamy, about 3 minutes. Add egg, molasses, fresh ginger, ground ginger, cinnamon and cloves. Beat to blend. Add flour mixture to wet mixture in two additions, beating on low speed just to blend between additions. Place 1/2 cup of turbinado sugar in small bowl. Measure 1 tbsp of dough (a 1-tbsp ice cream scoop works really well) and roll into a ball between palms of hands. Roll dough in sugar and place on baking sheet. Repeat with remaining cookie dough, spacing cookies 1-1/2 to 2-inches apart. Bake cookies until surfaces crack and cookies are firm around edges but still slightly soft in center, about 15 minutes. Cool completely on sheets on rack. Cream butter, sugar and peanut butter together with an electric mixer. Add egg, and beat until well blended. In a separate bowl, combine flour, salt and baking powder. Add the dry ingredients to the wet, adding milk as necessary to make dough just soft enough to handle. Stir in vanilla. 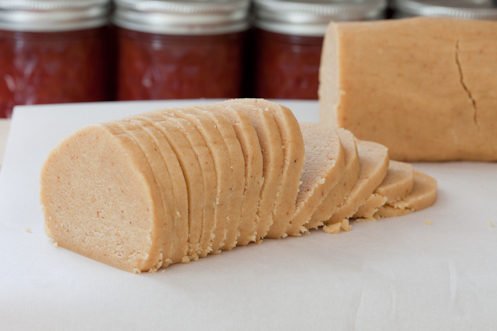 Shape dough into a log about 1-1/2 inches in diameter. [I suggest making two logs...the amount of dough makes one very long log that is difficult to transfer to the fridge]. Wrap dough log[s] in plastic and refrigerate for at least 2 hours or up to 2 days. Can be frozen if wrapped well. Heat oven to 400*. Line two baking sheets with parchment paper. Remove dough from refrigerator and cut slices between 1/8" and 1/4" thick from log. 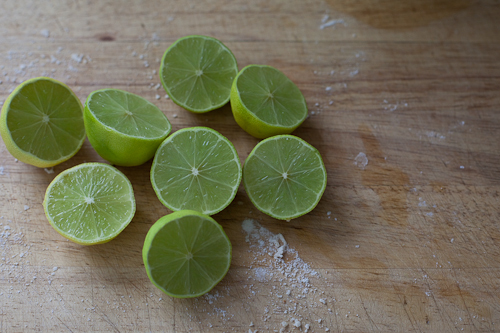 Try to make the slices as even in thickness as possible. Place on baking sheets and sprinkle with sugar. Bake until edges are lightly browned and centers are set, about 10 minutes. 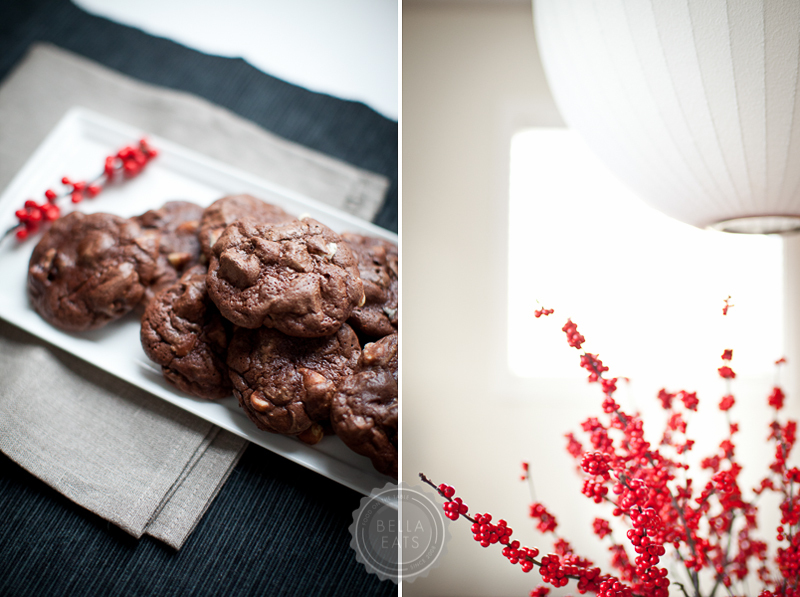 Cool for about 2 minutes on sheets before using a spatula to transfer cookies to a rack to finish cooling. 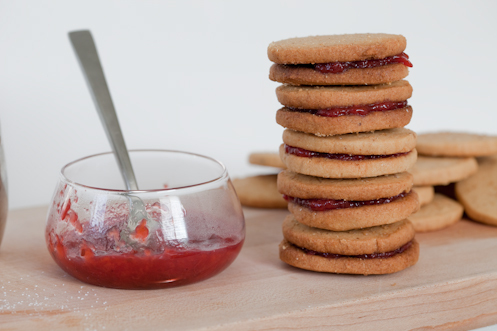 Sandwich flat sides of two cookies together with a heaping teaspoonful of jam. Preheat oven to 350* and line two baking sheets with parchment paper. Cream the butter and peanut butter together in an electric mixer on high speed. Add the sugar, brown sugar and vanilla and continue to beat until the mixture is fluffy. Add the egg and beat until combined. 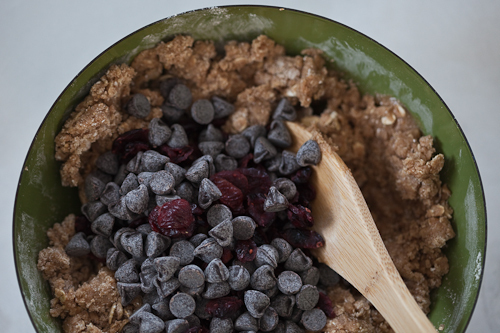 Mix the flour, baking soda, baking powder and oats together in a separate bowl and add to the wet mixture. Mix until well combined. 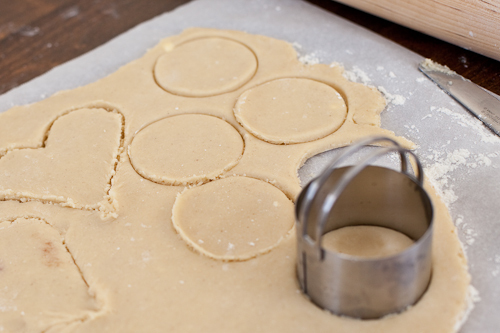 Roll dough into 1-inch diameter balls and place on baking sheets, leaving about 2 inches between each cookie. Using your pinkie finger, make a deep indentation in the top of each dough ball, being careful not to press all the way down to the baking sheet. Bake in the top half of the oven until cookies are golden, about 10 minutes. Remove from oven and re-shape indentations while cookies are still pliable, if needed. Let cool completely. 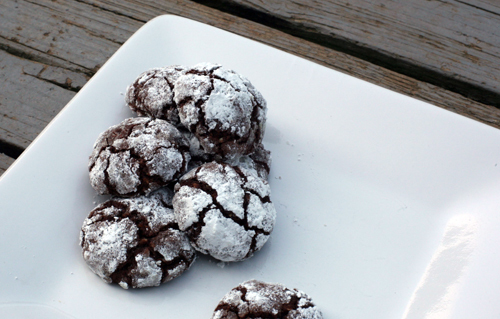 Once the cookies are cool, place on countertop and sprinkle with powdered sugar. 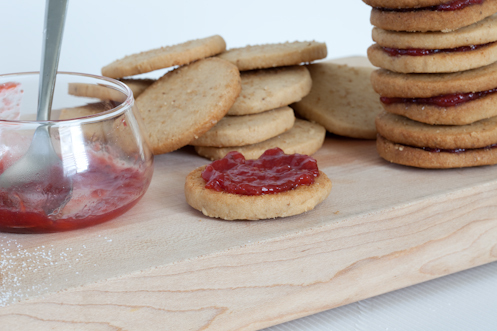 Spoon a teaspoonful of jam into each cookie. Spread the almonds onto a baking sheet and toast for 8-10 minutes, until fragrant. Do not burn. Remove from oven and allow to cool completely. Meanwhile, chop the chocolate into small pieces and melt it in a double boiler with butter and amaretto until smooth. In the bowl of a stand mixer, whip together the eggs and 1/3 cup sugar on high speed until pale, as pictured above (5-8 minutes). Stir in the melted chocolate mixture. Pour the cooled nuts and flour into a food processor and pulse until finely ground. Add the baking powder and the salt, and pulse a few more times. Stir the ground nut mixture into the chocolate batter. Chill for 1-2 hours, preferably 2, until batter is firm. When you are ready to bake the cookies, preheat your oven to 350 again and set up your bowls of granulated sugar and powdered sugar. 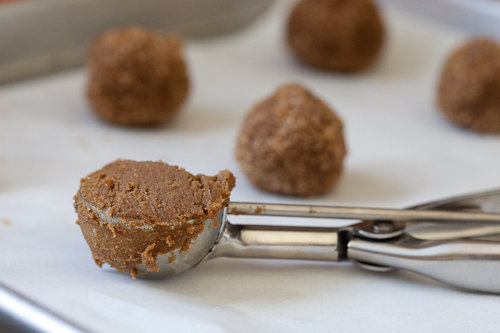 Roll the chocolate cookie batter into 1-inch balls. Roll each ball first in granulated sugar and then in powdered sugar. Set the cookies in rows, at least 1-inch apart, on two parchment-lined baking sheets. 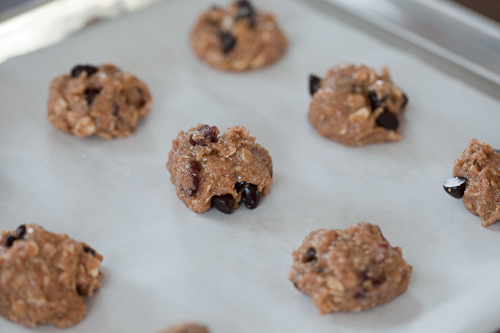 Bake the cookies for 10-12 minutes, swapping the top and bottom baking sheets about halfway through. 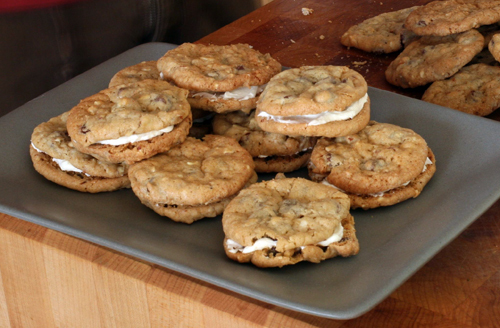 The cookies should be slightly firm around the edges, but otherwise soft. Cool on a rack completely, then store in an airtight container. Oh! And if you haven't noticed, I've added helpful links to the right side of the page for you to subscribe to Bella Eats, or follow me on Twitter, if you desire. Preheat oven to 325*. Line baking sheets with parchment paper. Finely chop oats in a food processor (we used a small chopper), mix in the flour, baking powder, baking soda and salt. Set aside. Using an electric mixer (we used a stand mixer) beat the butter and sugars in a large bowl until fluffy. Scrape down the sides of the mixing bowl and beat in the eggs and extract. Add the flour mixture in 3 batches and mix until just blended. 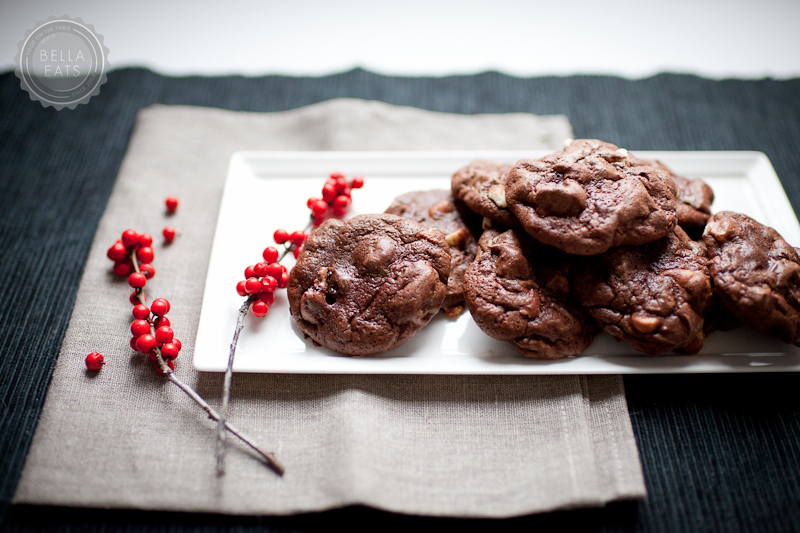 Gently fold in the chocolate chips and almonds. Drop dough (about one rounded tablespoon each) onto cookie sheet, two inches apart. Do not flatten. 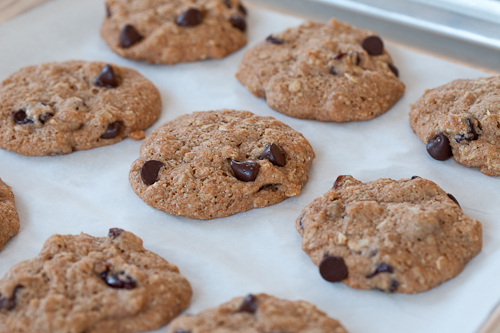 Bake until cookies are golden, about 13 minutes. Cool the cookies on sheets for 5 minutes and then transfer to wire cooling rack. In a stand mixer fit with whisk attachment, mix sugar and butter. Mix on low speed until well blended and then increase speed to medium and beat for another 3 minutes. Add amaretto and continue to beat on medium speed for one more minute, adding more amaretto if you wish.